The weather has been heavily overcast and foggy for the past week or so. 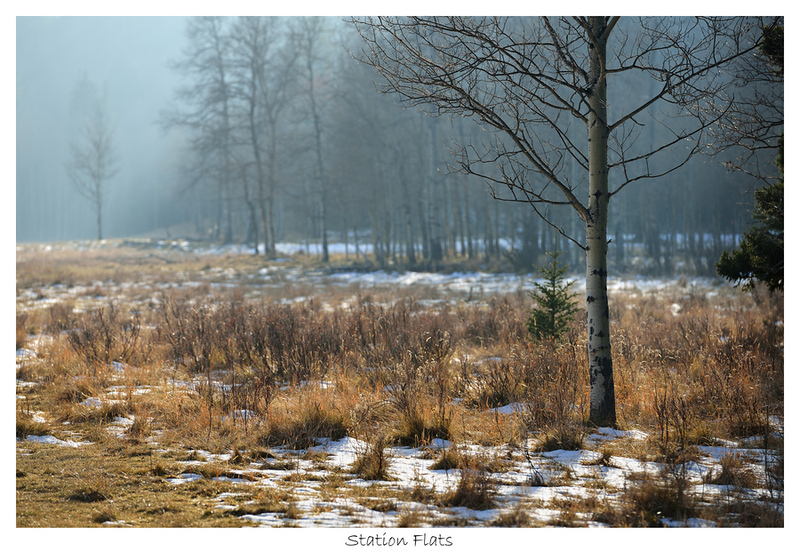 On Friday afternoon I was out at Bragg Creek for a walk around the Diamond T loop at Station Flats. Given the conditions, I was hoping to get some shots of trees receding into the heavy fog. As it turned out the fog wasn't thick and clinging to the trail the way that I'd hoped. The walk was still nice and it gave me a chance to try out my new boots. Towards the end of the trail I noticed that there appeared to be some blue sky forming then some of the clouds actually parted and the sun started to break through. All of a sudden there was some beautiful light. I liked the contrast of the bright trees standing against a darker background. A little further on down the road the light was streaming in from the side, the colours are subdued. Soon the sun was down and the light was gone for another day. Driving back towards Calgary the sky was still overcast and foggy. It seems I had been lucky enough to find a hole in the clouds and see some sunshine which can be a welcome sight after weeks of cloud cover. I must say, I'm humbled and proud to be a Canadian after my experience on Sunday. It was amazing to have the opportunity to see, first hand, a small sample of the vast and varied landscape that my home country has to offer. On Sunday I got up at 4:30am. Went to the airport and climbed aboard a plane and flew two and a half hours to Churchill Manitoba to go on a one day Canadian Safari to see wild polar bears as they gather and wait for the sea ice to form so that they can start their winter hunt of ringed seals. Thanks to my family for supporting my photographic passion and giving me the opportunity to make this trip. On the Safari I was lucky enough to have incredibly good weather and see all kinds of wildlife. We saw at least 10 polar bears, flocks of willow ptarmigan, a curious red fox, a flock of snow buntings, a gyrfalcon and a snowy owl. The day ended with a spectacular sunset that everyone said was completely rare for Churchill. While I wasn't able to photograph all of those things, I feel fortunate that I was able to get as many shots as I did. Above is one of the first Polar bears we saw. 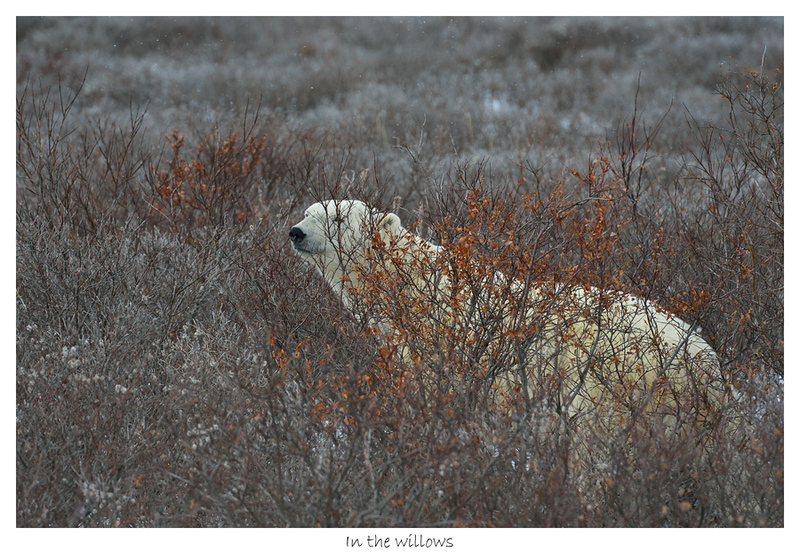 As the Tundra buggy drove by he popped up out of the willows where he was resting and started moving away from us. 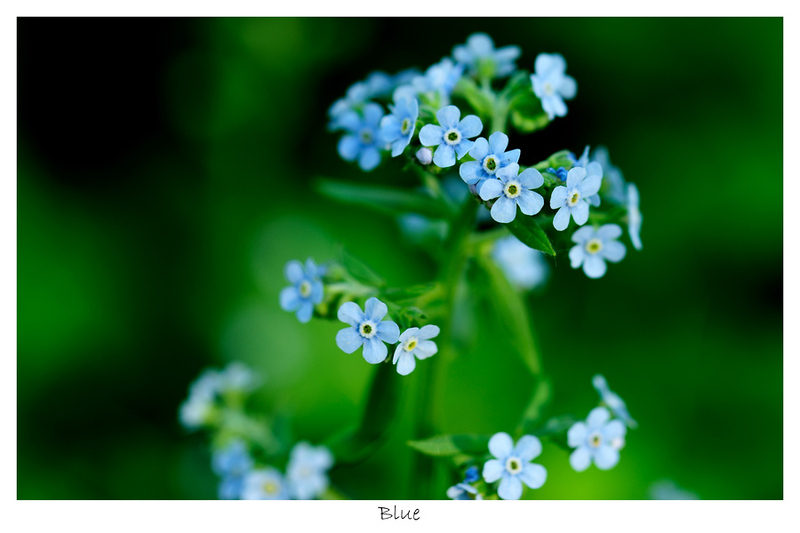 I have many photo's to share and have created a special gallery here to hold them. Over the next week or so I'll keep adding photo's to this gallery so check back often. The Calgary Herald also had a good article on the trip. Driving down 26th street the sun was low on the horizon and had just peeked out below some clouds. Looking towards downtown and the western sky I couldn't help but stop and take a few photo's of the sunset. Soon the leaves will all be off the trees and the snow will be flying. Luckily I had my camera with me (If you don't know me, I always have my camera with me ;-) There wasn't much time because I was on my way to pick up Conor from Grandma's house and take him to his piano lesson. I wasn't stopped for too long and still got Conor to his lesson on time. Phew! Hello. It's been a while since I posted anything on the blog (last post was July 11th). I guess this happens sometimes, you get busy and don't post anything. What I'd like to do is back post entries until I'm all caught up. I've taken a bunch of pictures since July and even thought you could go look at them, there isn't any context. I'm hoping to rectify that. I took this picture over lunch hour after walking around aimlessly for 30 minutes. I was intrigued by the way the sunlight was reflecting on the buildings across the street. At first I felt a little funny taking my camera out on the street with people around but after I put the viewfinder to my eye I was able to block it all out and concentrate on the photo I was trying to make. I hope you like it. 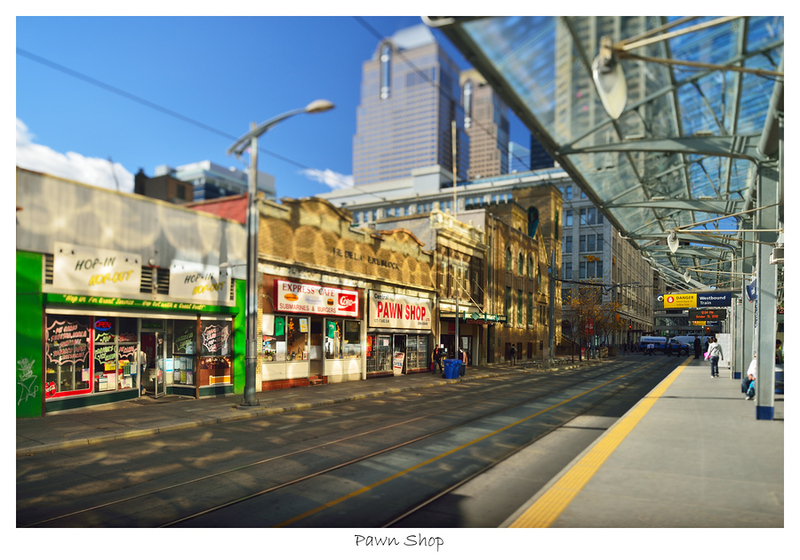 I used the tilt-shift lens to try and isolate part of the street. On my way to pickup Clare from the Stampede on Wednesday night I was a little early so I decided to park at Pearce Estate Park in Calgary near the Bow river. The city rebuilt the weir a year or so ago and by doing so introduced a new recreational area for water sports. I initially walked through the park thinking I was going to shot some macro or landscape shots but I came across these two kayakers in the water and there was a nice low sunset light so I started shooting. I got a few shots of them from upstream then moved downstream for more rim and side lighting. 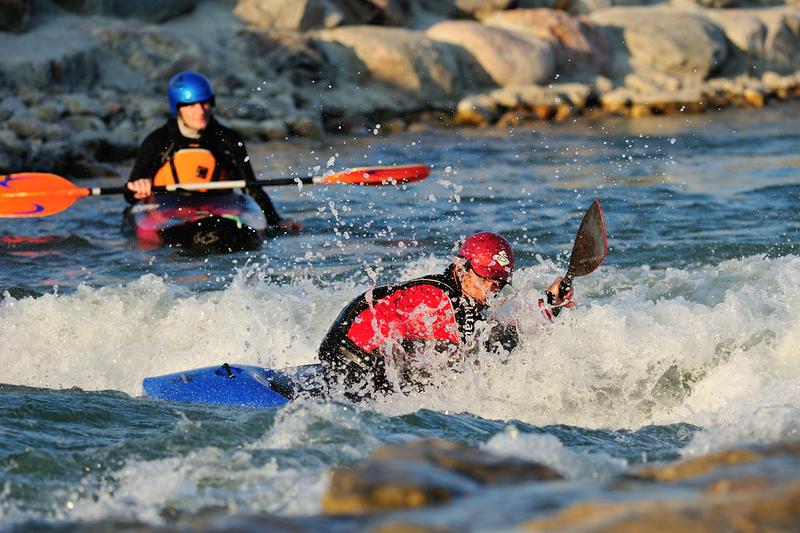 The fellow in the Blue helmet was racing back and forth across the waves and the fellow in the Red helmet was doing summersaults in the rapids by diving face-first into the river. This is a short post to show off some wildflowers I'd found after making a quick trip out to Glenbow Ranch just east of Cochrane on the 1A. What I liked about this particular plant is that the flowers spiral around the top giving it a nice shape. On the rest of the walk I saw a downy woodpecker, a pair of American Gold Finches, Cedar Waxwing's, some old crows and many other wildflowers. I could have spent hours out there. I wish I had more time to wander but I am grateful for the time I did have, perhaps as the summer slows down (!?) I'll be able to find some time. 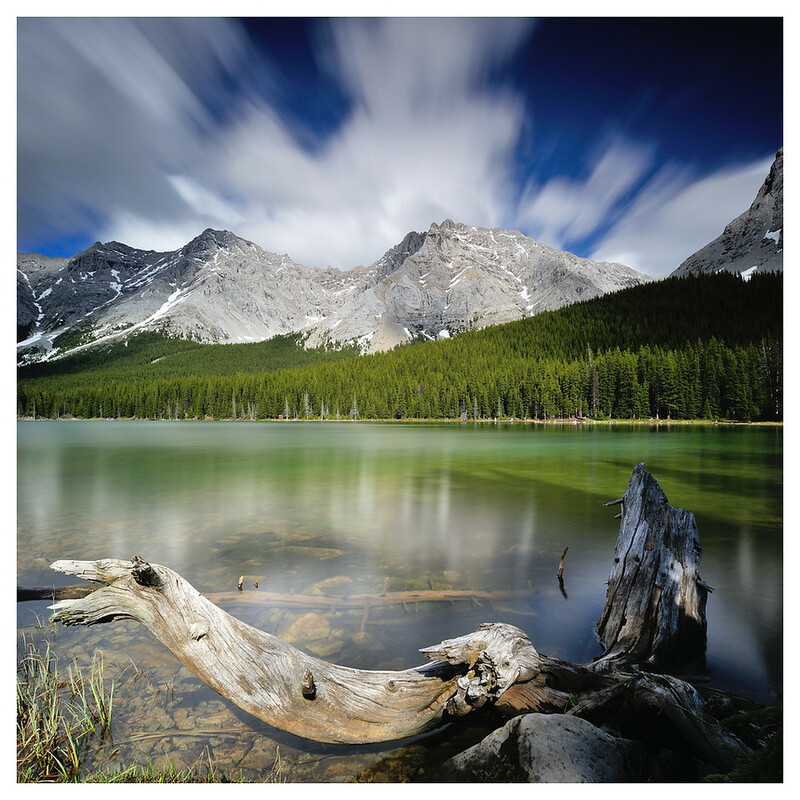 After work on Friday I drove out to the Kananaskis for some photo time. It really feels like the month of June just whipped by and in a flash it was gone. I'm not really sure where it went. I remember lots of rain, heavy clouds flat light, I must not have been out much. 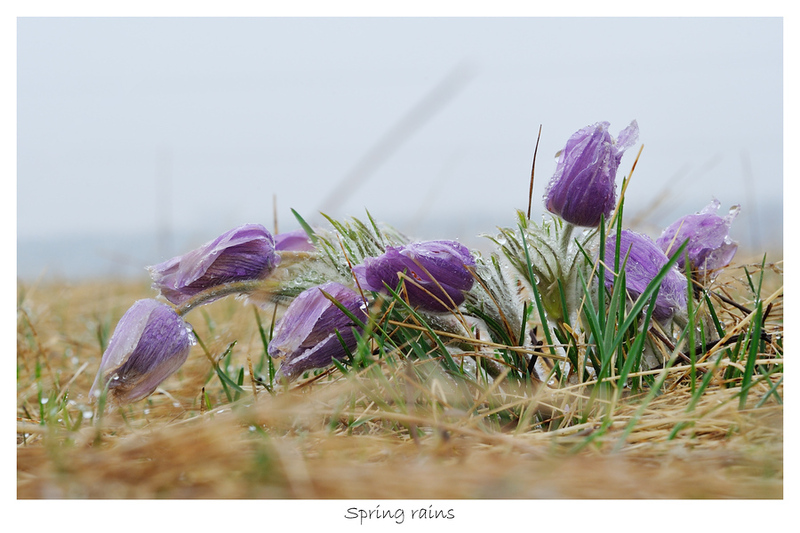 I`m a little disappointed as our spring and summer is fleeting. It feels like time was lost. We`ve already passed the first day of summer and the days are starting to getting shorter as we head straight into the darkness of winter! As I drove down Highway 40 I figured I would go to Elbow lake and take a look around. I "discovered" the lake last year and I think there are still lots of photo opportunities to be realized. It's a pretty short walk far from the parking lot but you still get the feeling your deep in the mountains. There is a backcountry campground at the head of the lake I think I'd like to try staying there overnight. I'm sure Conor would come up with me. The three times I've been here the clouds have always been moving past at a high rate of speed. It must get windy up there in the sky but in the valley where I was it was pretty calm. I wanted to smooth out the water so I used the dark filter to increase the shutter time to 30 seconds. This also caused the clouds to blur across the top of the frame. What I like about it is that the clouds were moving directly away and the motion helps highlight the center of the picture. This is a two shot panorama cropped to square dimensions. There was a herd of mountain sheep on the highway and some glacier lilly's alongside the trail that I also took pictures of. As of this writing, I've not posted them to the portfolio yet, but when I do, you'll be able to find them and any other shots from today here. 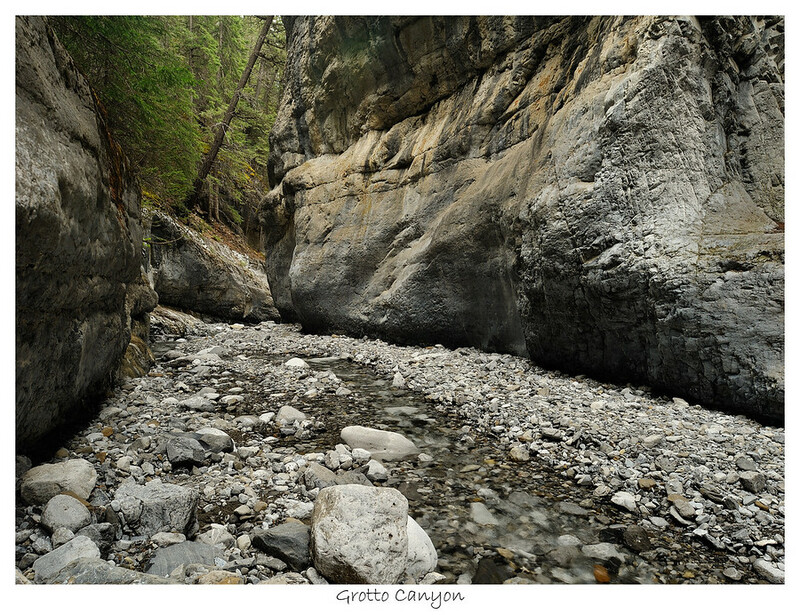 We went out to Grotto Canyon for a quick walk for Fathers Day. The sky was overcast and cloudy which works out when your trying to photograph in the canyon. There is a nice even light with soft shadows. If it was sunny there would be harsh super bright light on one side and and dark dark shadows on the other. It's not to say either one is better or worse, but you have to adapt to the conditions. I was hoping for a nice soft light on this trip. I remember rounding a corner and gasping at how incredible the scene looked. I tried to capture the feeling that I was experiencing but I don`t think I was successful. Looking at my images it seems I focused too narrowly, the feeling came from the enormity of the location. I wish I had framed those shots a bit differently, taken in the whole view. The picture below is another location that comes close to capturing the feeling I was trying to capture. I had tried to shoot this location on the way in but there were some rock climbers who decided that these were the rocks that they wanted to climb. I wasn't quite brave enough to shoot the scene with the climbers in there so I moved on and stopped on my way out of the canyon. This shot is a composite of two photos, a top and a bottom to make up the whole frame. I really like how it turned out. On June 3rd, I'd hiked around Mt. Yamnuska with Conor. Since that time I wanted to go back and see if I could get some shots with some better light (ie, sunshine) so I booked Thursday afternoon off of work with the thought that I could be up on the mountain by 4:30 or 5:00pm if I left Calgary around 1:00pm. As I was driving out the sky had a bit of drama in it. It was partially cloudy with scattered rain showers. Once in a while the sun poked through the clouds and lit up the ground. I was a bit nervous about climbing up the mountain because the weather could turn on me and I really didn't want to get caught in a torrential downpour and I was hiking solo. Given it was mid week and later afternoon, I didn't expect to see many people on the trail. As it turned out I had pretty good weather on my trip. There were rain clouds dripping across the landscape but no rain fell on me. The sun peaked out and gave me the light I was looking for. Actually, I think the shots turned out better than if there was only plain blue sky. The dramatic clouds were a nice addition. When I was hiking on Fullerton last weekend, I'd been thinking about how I seem to return to the same places and when in those same places I take the same shots over and over again. This case was different because I primarily came out here to make the shot that you see above. 2012 Calgary Stampede Photo Gallery and Competition. Late one night in the coldest darkest month of the year (February) I mustered up enough courage to enter the Calgary Stampede's Photo Contest and Gallery Exhibition. I`m pretty sure I entered right at the last hour of the deadline which was at midnight. The theme for the contest was Western. I found it challenging to find Western themed photos in my portfolio because I primarily shoot landscapes but not Western landscapes. To me that means horses, barns, cowgirls, pickup trucks, big shiny belt buckles and things like that. For some reason, I think the Western theme is dominant at the Calgary Stampede so if I want to enter next year I'll have to keep an eye out for those kinds of things - especially the cowgirls. 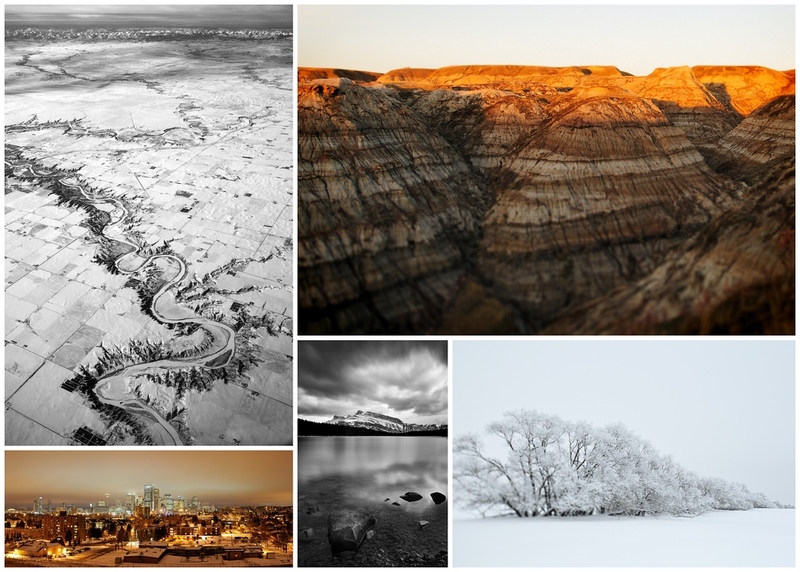 In spite of not having Western themed art in my portfolio I did submit a set of pictures for their consideration. The winners were to be announced and contacted by May 1st. I wasn't contacted and just yesterday found a list of winners on their website. Congratulations to those who won! It doesn`t look like the photos are posted so you`ll have to go down to the grounds to see them. 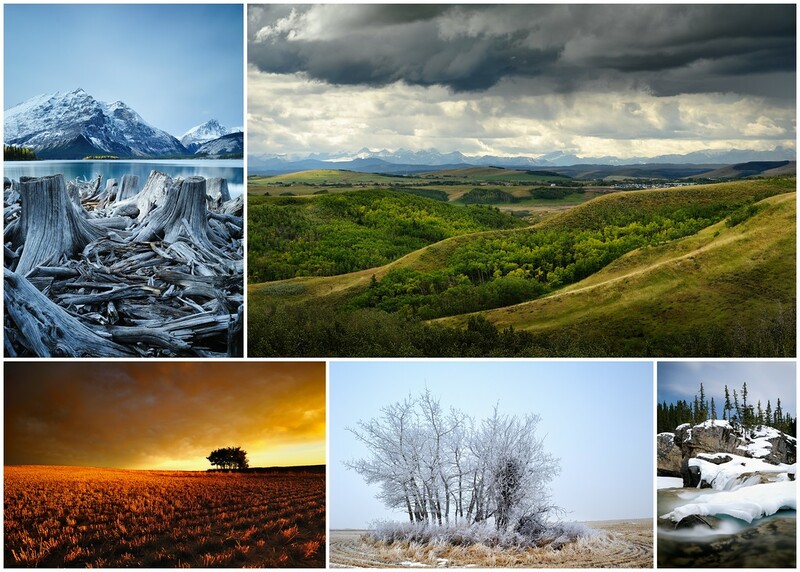 I created this nice collage of the photo's that I submitted. 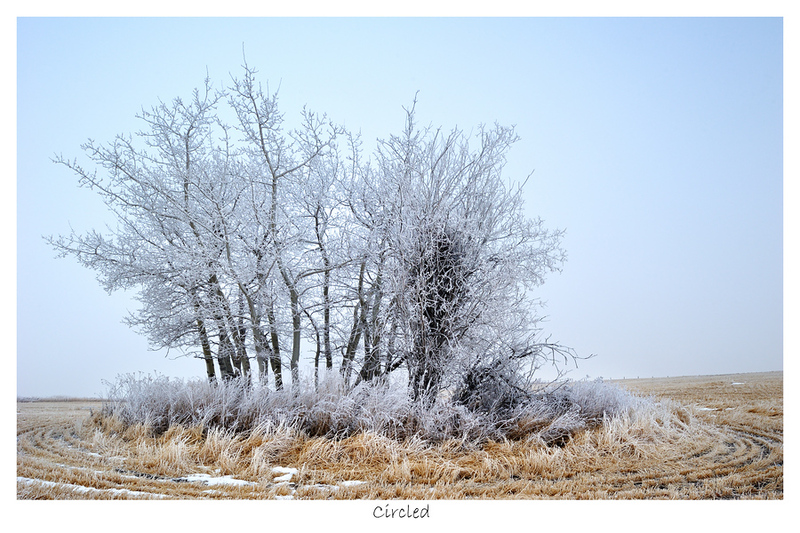 Left to right, the photos are: Silver, Foothills, Wheat Field Sunrise, Circled and Flow. For the Exhibition, they wanted ten photos. I submitted the five from above and these five as well. I'd gone for a drive on Saturday heading out on the 1A towards Canmore. When I left Calgary it was cloudy but clear. It was raining in Cochrane and by the time I got to Exshaw it was snowing!! So instead of taking any pictures I had lunch in Canmore and drove home. It was frustrating in some respects. On Sunday I still wanted to make some photos so I left thinking I wouldn't go as far west in case there was still inclement weather. I drove out to Kananaskis west of Bragg Creek. I thought I could hike Fullerton loop near Allen Bill Pond or Powderface ridge which is further west near Little Elbow. Given that I could see snow on some of the western peaks, I decided on Fullerton. As I walked along the trail I thought about how I tend to go back to the same places over and over again, which is fine, but what I find is that I often seek out the same photographic locations every time I'm there. I have a picture from Fullerton Loop that I really like and when I think about walking this trail I think of that picture and I make a point of going back to that spot to see what it looks like. This isn't really a problem because it could be a different season or different time of day or different lighting and maybe I'll get a better picture. The thing I noticed was that I was missing out on other opportunities because I was bee-lining it to the spot that I already know to see what it looks like. So, with that thought, I purposely tried to find new vantage points to take photo's from. Conor and I hiked around Mt. 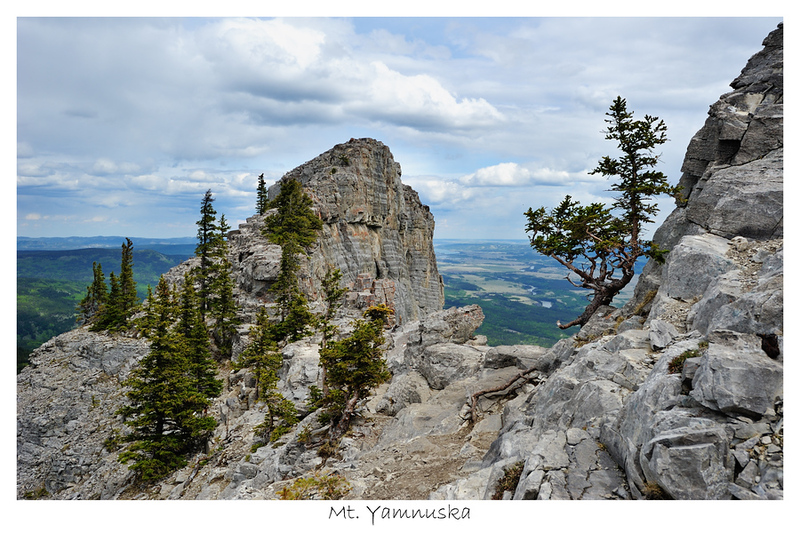 Yamnuska on Sunday. We'd left the house around 10:00am but had to stop for gas and picked up some snacks and bottled water from CO-OP and a bit of an early lunch from Wendy's, then I stopped in Cochrane to get a coffee, by the time we got to the trailhead it was noon. Our goal was to hike to the summit of Mt. 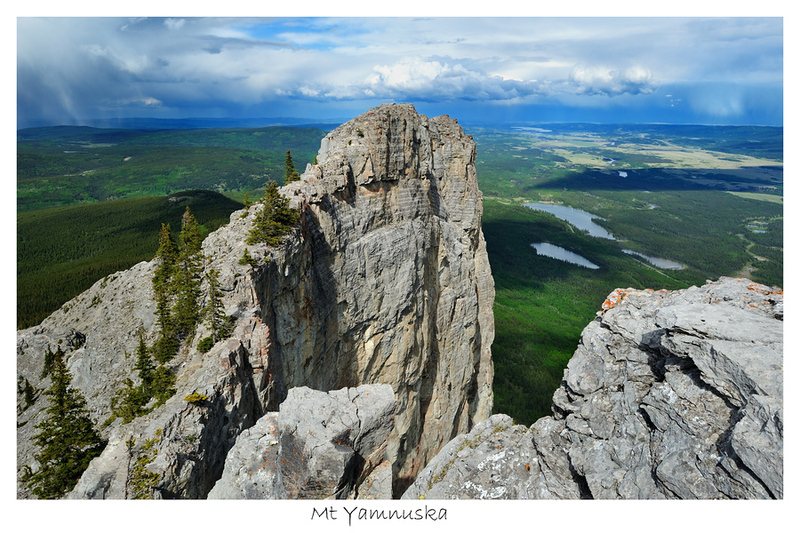 Yamnuska then circle around and come down the scree slopes. Last year when we hiked here we had gone the wrong way around and I say this because it meant we had to climb UP the scree slopes on the front of the mountain. The rocks are very loose and for every step you take, you lose about 4/5ths your elevation gain when the rocks slide and settle around your foot. When we were climbing up the slopes we observed other hikers (little kids even!) were coming down using a method of running/jumping that looked like a lot less effort and a lot more fun. They all had huge smiles plastered across their faces as they floated down the mountain. We wanted to float down the mountain too! We were both excited to go the right way around this time and were really looking forward to coming down the slopes. I'd packed my camera with a few lenses for the trip the weather was cool with heavy clouds and looking towards the west it looked like it was snowing or raining a fair bit and I was worried we'd get caught in inclement weather. I was also concerned that the light wouldn't be great. I really love the location in the photo above I think it's a real unique scene with lots of good photographic opportunities and I want to try going back with different lighting conditions. I'm thinking early evening with some real nice light to highlight the rocks. It took us about two and a half hours to get to this location. In my head I'm trying to figure out the logistics so that when the weather looks like it's going to co-operate I can dash out there and be on the mountain again. 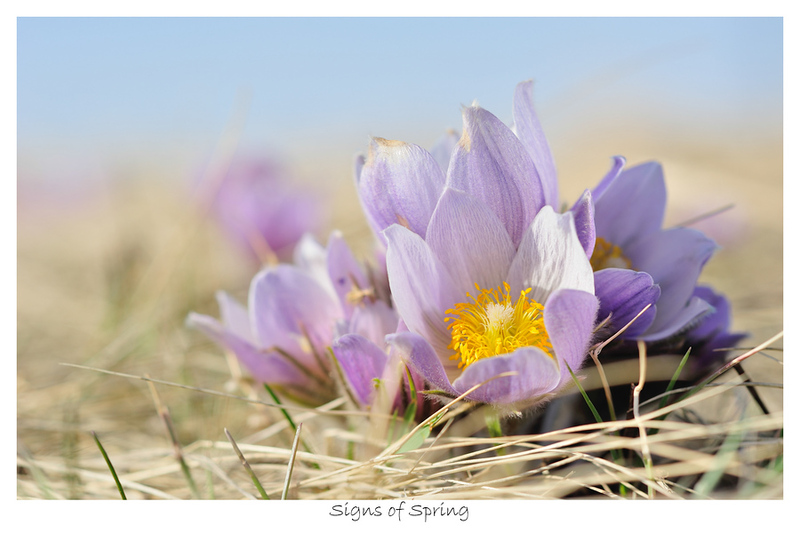 I had been out at Glenbow ranch on the weekend to pick up a copy of the newsletter when I saw some crocuses on the side of the hill. My camera was in the car and I was in a bit of a hurry so I wasn't able to grab any shots. A few days later I was out at lunch talking a quick walk along the hill in Bridgeland to see what the city skyline looked like when I spotted some crocuses blooming in the dog park. I was somewhat surprised to see them there and went back a couple days later after work to make some shots. Lying on the ground seemed to be a good vantage point for this kind of thing - I just had to watch out for poop and unleashed dogs that were interested in checking me out. A few days later I was back again! It had been raining all day and after work I had to pick up Clare from school - she was late because she had to practice for the school play. We'd gone to the Starbucks in Bridgeland for a tea latte and a coffee when I thought about the flowers that were near by, how they'd be all wet and how they were fuzzy and how the fuzz might have trapped some water droplets so I had this vision of what the flowers would look like and of course I had to go see. I asked Clare if she wanted to go - luckily for me she said yes but I probably would have made her go regardless. So this time I was lying on the ground watching out for poop with unleashed dogs checking me out and I was getting all wet in my work clothes because really; you need to get up close and personal with flowers and lying on the wet ground in the rain is a small price to pay for such a fantastic view. Later it turned out that everyone forgot Clare had to be at the Boys and Girls club for cooking class. So it was a race to get her there. She made chocolate chip muffins and ate them all herself. I have a contact on Flickr who posts lots and lots of bird photos from around Calgary and the surrounding areas. He had posted a few shots of the grey owls out by Water Valley and quite frankly I couldn't take it anymore. I had to go see myself. This was my second time trying to drive down the Grand Valley road to find owls this spring. The first was a couple weeks earlier where I ran out of time and had to turn around and come back. I still had loads of fun driving those curvy country roads! The second time I went out there I had more time which was helpful because I found a hawk owl perched high on a tree. After spending 30 mins trying to get some shots of him sitting atop the tree ignoring me I left and came across this grey owl just sitting on a tree beside the road. I like owls much more than hawks - sometimes the owls just check you out and decide to go back to whatever they were doing before you came along. The hawks almost always fly away before you can get anywhere near them. I stopped, got out of the car and actually used my tripod with the long lens cause it was a bit overcast and I wasn't going to get high shutter speeds. I took some shots and moved closer, shots, closer, shots, closer. Eventually I couldn't get closer because he was filling the frame of the camera. He did fly off a couple of times and I followed through the heavy wet spring snow that had fallen overnight. I'd put on my winter boots when I got out to look at the hawk owl so I thought I was OK. The snow was really deep in places and pretty soon my legs were wet from kneeling down to frame pictures. The snow was getting into the tops of my boots and making my feet wet, and stinky. I really need new boots, these ones are about 10 years old and are starting to go. Three weeks later my boots were still wet inside! Anyway, after getting a bunch of shots I decided to leave the owl alone - not that I felt I was harassing it or anything like that it was just time to move on. 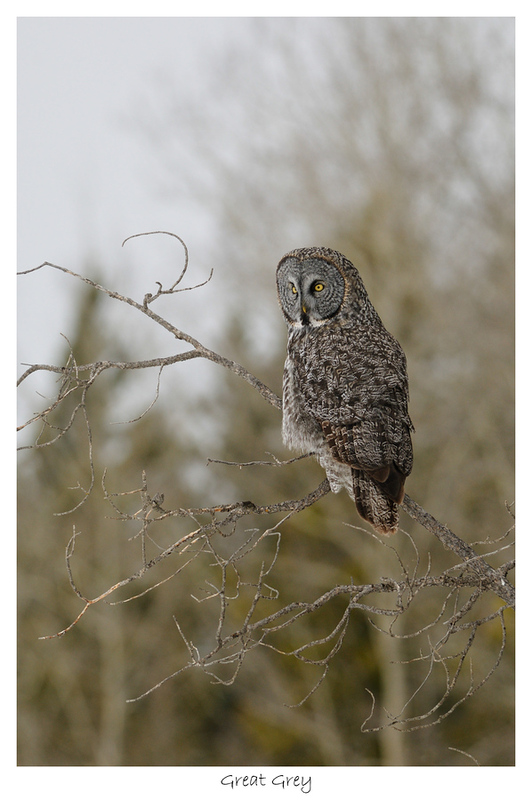 I quickly came across ANOTHER grey owl. I parked and watched it for a while in my wet, stinky boots. He surprised me by jumping off the tree he was on and floating across the field like he was hunting. I say floating because at one point the owl was moving so slowly that I thought it was just hovering without moving his wings. It was incredible and I feel privileged to have observed it. The trade off to that is that I was so flustered that I missed the in-flight shot. Still, I felt fortunate to have found two grey owls and a hawk owl. I've now seen four types of owl this year. Hawk, Snowy, Grey and Horned. I'm fortunate indeed. Click here for more shots from this day. On the way into work this morning I grabbed my coffee from the Center street Starbucks and then drove over to the hill in Crescent heights that overlooks the city. 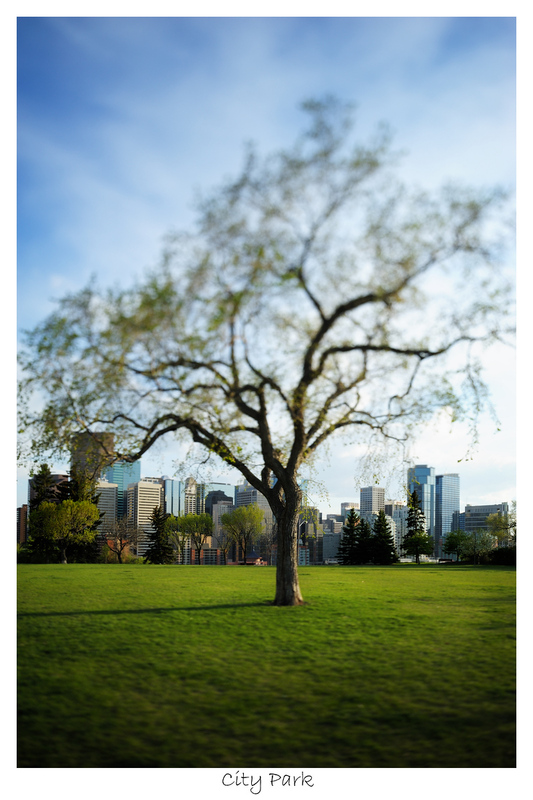 The hill overlooks Memorial drive, the Bow river and Princes Island park in addition to the downtown core. I stopped because it was very cold outside and I thought the exhaust from all the buildings would make a cool picture (literally :-). 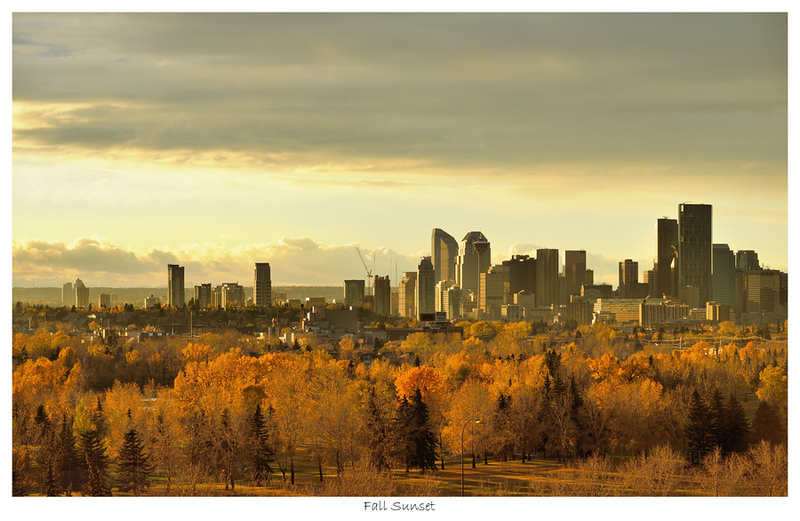 I took three shots and stitched them together to make a panorama of the skyline. Each shot was a 15 second exposure, while the camera was exposing, I was jumping up and down to get my blood circulating to try and get some warmth back into my fingers. Needless to day I wasn't out there too long. I hope you like it. First real cold snap this winter came in over night. Temperature was -17c with a windchill of around -30c. When I peeked outside I noticed a halo around the sun and I figured I would try to catch it. 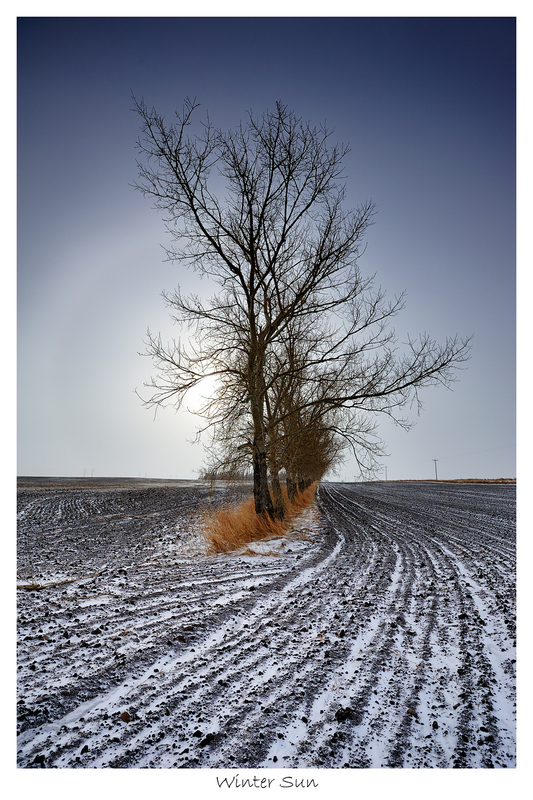 I didn`t have a lot of time so my goal was to drive east and look for some trees to help in the composition. I ended up at the same place as the morning of October 8th when I was out looking for a sunrise. The sun was low enough that I could position it behind the line of trees. There is a pretty interesting pattern in the dirt with the snow on it. I like how this turned out although I wish the halo was a bit more pronounced. After a few shots, my fingers started to get a bit chilled so I packed up and came home. We`d gone up to Banff for a few days while the kids were off school for Christmas break. We stayed at the Douglas Fir resort. The kids really like the Douglas Fir because they have a swimming pool with some fun water slides. When we weren't swimming, we were skiing :-) Conor and I skied at Sunshine on Thursday then Lake Louise on Friday. Photographically speaking, I didn`t take many pictures on the trip. I`d have loved to have had my camera on the slopes as the scenery is incredible but I`m sure I would have spent more time taking pictures then skiing so I`m glad I left my camera in the car and didn`t tempt myself. I had a hard enough time keeping up with Conor. I get nervous skiing with Conor because he's always pushing to go bigger and better. Sometimes I feel like Nemo's Dad trying to reign him in. In the end we had a great time. I tried to make pictures twice. 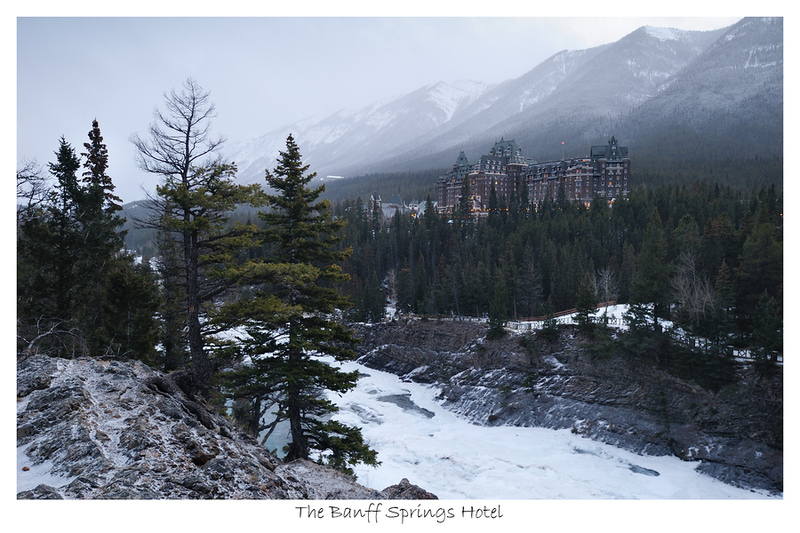 The first time was a short stop across from the Banff Springs Hotel. 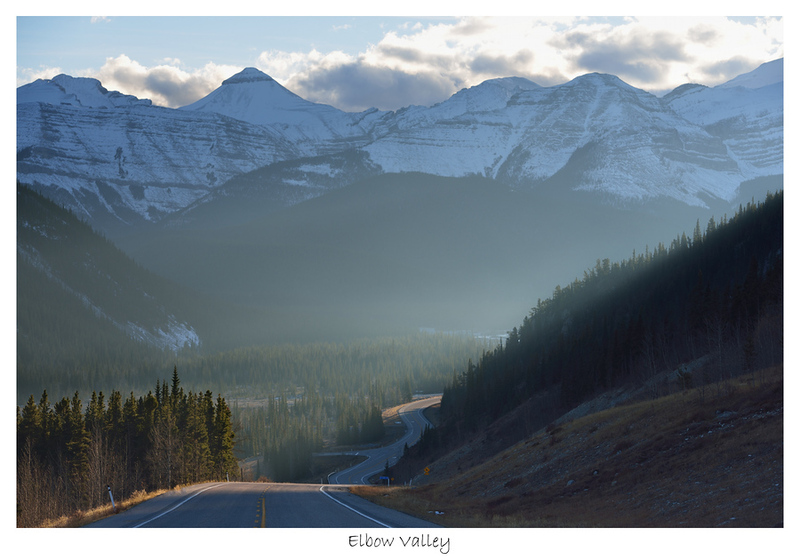 The second shot was taken after I drove out towards Lake Minnewanka. Stepping out onto the deck this morning I saw frost on the trees and a bit of fog in the air. I was excited and thought that the fields east of the city might be covered in frost. So I grabbed my bag, ran out of the house and started driving. It seemed that the fog was just skirting the east side of the city and the further out I went the thicker it became. There is a stand of trees in a field not far from the house that I've shot before I thought this would be a good place to start. 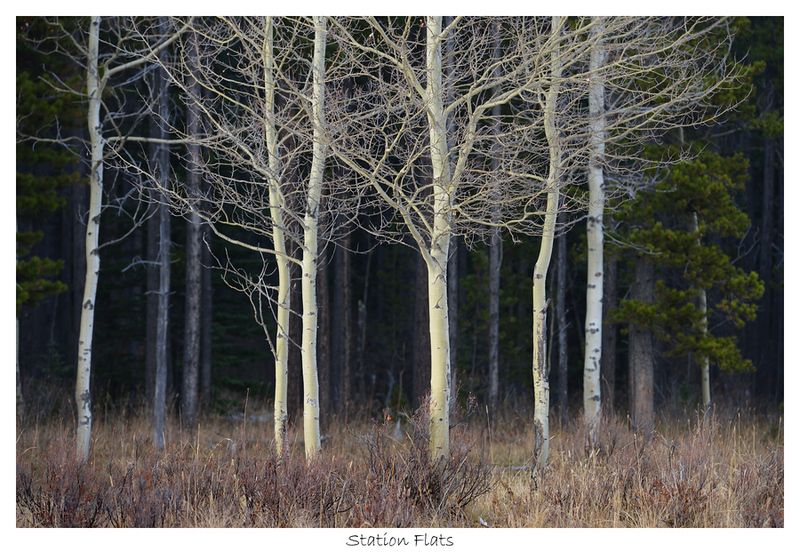 I parked near the field and walked in towards the small stand of trees looking for an angle to shoot from. Facing north the sky was quite flat and I was hoping to include the sun and get some nice light. Circling the trees to look from the other side there wasn't much frost on the trees. I guess the frost had come in with the wind and only collected on the south facing side. So, with the direction set I started shooting. The first set of photos were from further out and had a lot of field and sky in them. I kept moving in closer to the trees taking shots as I went. I like this view because it's close enough to see details in the branches and I really like how the circles on the ground surround the trees.